President Donald Trump on Jan. 16 nominated Heidi King to lead the National Highway Traffic Safety Administration and also announced more nominees for senior roles at other agencies that oversee safety and commerce. This is the second time the White House has put forth King’s name to lead the safety agency; she was also nominated to the post during the last Congress. While it appeared the previous Senate might consider her nomination — last summer, the Republican-led Senate Commerce Committee advanced her nomination to the floor by a vote of 14-13 — that nomination expired once the last Congress adjourned. 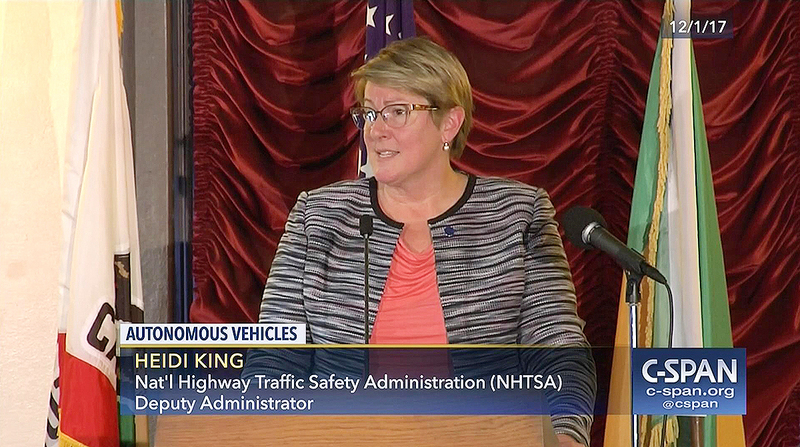 King is NHTSA’s deputy administrator. Her government tenure has included a stint as a regulatory policy analyst at the Office of Management and Budget, and she also previously served as chief economist at the House Energy and Commerce Committee. In private industry, King worked for Pfizer Inc. and General Electric, according to background she had provided the Senate Commerce Committee. Last summer, the Republican-led Commerce panel advanced her nomination to the floor by a vote of 14-13. President Trump also renominated Diana Furchtgott-Roth to become assistant secretary of transportation, a new position, and also advanced Thelma Drake to the top leadership post at the Federal Transit Administration. Both had also been nominated in the last Congress. Furchtgott-Roth formerly was the chief economist at the Department of Labor. She also served as chief of staff of the president’s Council of Economic Advisers and was deputy executive director of the Domestic Policy Council and junior staff economist at the Council of Economic Advisers, according to background the White House provided. Also earning renominations were Michelle Schultz to become a member of the Surface Transportation Board and Joseph Ryan Gruters, Leon Westmoreland and Rick Dearborn to become members of Amtrak’s board of directors. With the exception of Drake, these nominations were referred to the Commerce Committee. Hearings have not been scheduled to consider the nominations. Drake’s nomination was once again referred to the Banking, Housing and Urban Affairs Committee. The new Commerce Committee chairman, Sen. Roger Wicker (R-Miss. ), oversaw an organizational hearing on Jan. 16 to announce leadership roles and tasks for the subcommittees.